Human beings have proven their mettle in the field of architecture and designing at various occasions since ages now. The strong evidences of this and the miraculous nature of the human mind are these seven structures which stand strong and high. 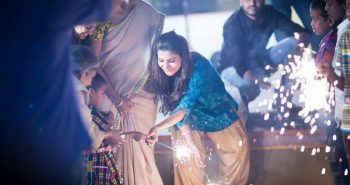 They are the glory and pride of not only the nations that host them but of the entire world. 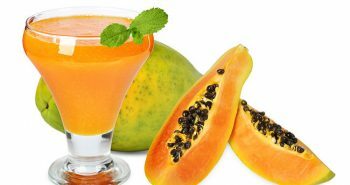 The Seven Wonders of the World are so immaculately designed that it makes one wonder if these were really created by the labors of man. The Great Wall of China is undoubtedly an overwhelming accomplishment of various emperors of ancient China. 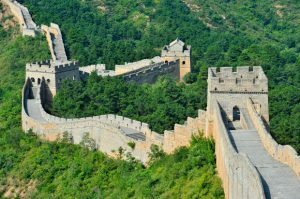 Few know this, but the Great Wall was built in parts and the older parts of the wall have already begun to erode due to various natural phenomenon. The Wall stretches from west to east, across deserts, into gorges, above mountain peaks and finally confluences with the sea. Converse to the popular belief that the Great Wall can be seen from space by the naked human eye, it can only be seen with aid. It is only worthy that this wonder has various legends linked to it. One of the most popular ones is the tale of Meng Jiangv, whose husband died building the wall. It is said that her weeping was so bad that a section of the wall collapsed only to reveal the bones of her dead husband so she could perform her last rites. The Great Wall is a symbol of China’s rich culture and remarkable evidence of the nation’s extraordinary art of defensive architecture. An old Chinese saying goes, ‘He who does not reach the Great Wall, is not a true man.’ which has attracted millions. The city of Petra, Jordan, is one of historical and archeological importance and is rightly counted as one of the seven wonders. The city is incredibly well-known for its rock-cut architecture and water conduit system. The city of Petra is also known as the Rose City due to the red color of the stone which was used to build it. 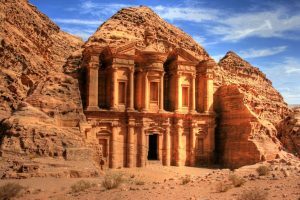 Johann Ludwig Burckhardt, a Swiss traveler discovered Petra in 1812 and because it remained a nameless unit for about five centuries, it is also called the ‘Lost City’. The entrance to Petra is a narrow canyon of about one kilometer length and is bound by 80 kilometer tall stones known as Al-siq. The residents of Petra were the Nabataeans who were apparently the worshippers of the sun and they built the city to map the astronomical cycles of the sun. Match me such marvel save in Eastern clime, a rose-red city half as old as time. The Christ Redeemer Statue stands tall on a mountaintop gives a single message ‘Christ Loves All’. The Statue, 38m high, is situated on top of the Corcovado Mountain and overlooks the city of Rio de Janeiro. The Statue was created over a period of nine long tedious years and us made from reinforced concrete covered with soapstone. The soapstone used in the construction once proved to be its savior, when lightening struck as it has insulating properties which minimized the damage by a big number. It is said that the best time to visit Christ the Redeemer is at night because it is lit up by flood lights which give an illusion of levitation. To get to the Statue of Christ the Redeemer, one has to get on a train ten use elevators and escalators or take a stairway of 222 steps. When the blueprint of the statue was first put forward, the plan had to be trashed as there were not enough funds, but with joint effort of the Government and churches of Brazil, the Statue was finally erected. 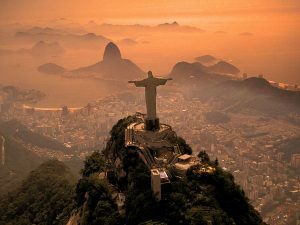 When one sees Christ the Redeemer, it appears that Christ has opened his arms to the world and is welcoming every being to seek peace and shelter. The well-designed city of Machu Picchu is an excellent example of the of the civil engineering skills of the Inc people and their ability to use color to transform what looks plain to the eye to one of the most beautifully painted structure. Machu Picchu is also referred to as the ‘Lost City of Inca’ because it was argued to be an altogether different city, when it was discovered. 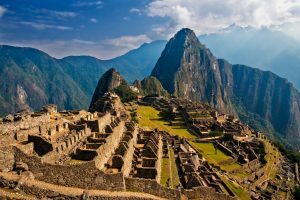 Peru and the neighboring nations lie at a location that is seismically unstable and the city of Machu Picchu has been previously hit by earthquakes at various times as it lies directly over fault lines. You will be amazed to know that when the city receives these blows from seismic waves, the rocks ‘dance’ that is they literally bounce up in the air and fall back into their original places. The city is standing strong only because of the brilliant techniques used by the Inca people to build it. At the foothills of the structure, lies a hidden museum which holds answers to all the mysteries of the Inca people and their bizarre city of Machu Picchu. Situated on top of the Yucatan Peninsula, Chichen Itza is an enormous city which was built by the Mayan people. 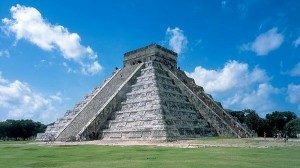 The word ‘Chichen Itza’ is actually derived from a Mayan name meaning ‘on the mouth of the well of Itza’. It is also referred to as the ‘El Castillo’ which translates to ‘The Castle’ in Spanish. One of the theories as to why the Pyramid was built at its present location is that there are two sinkholes atop which the structure stands. These waterholes must have been the primary sources of water for people of that region. One of the two sinkholes was a prime location for the Mayan people to make sacrifices to the Gods and conduct many other rituals. The Pyramid is supposed to have had religious significance to the Maya and could have been a place of worship. This monument is visited by more than 1.2 million people every year, making it one of the most popular one. The Roman Colosseum of Italy is truly a prime example of man’s outstanding architectural abilities. This great amphitheatre was built as a gift to the people of Rome to celebrate their accomplishments and the glory of the Roman Empire. The design and technique of this magnificent structure is used till date in designing stadiums. 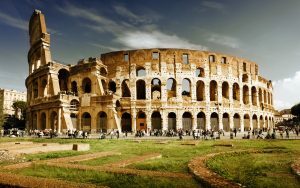 The Roman Colosseum was hit by an earthquake and severe damage was inflicted upon it, such that the outer south side of it collapsed and the stone was then used to build other structures like churches and palaces in Rome. The Roman Colosseum was highly infamous as the ‘Arena of Death’ because after it was built, in less than 100 days more than two thousand gladiators and five thousand animals were slaughtered. But as a reformative measure, the Colosseum has come into view as an important symbol in the crusade against Capital Punishment. The Colosseum is unquestionably one of the most beautiful structures built by humans and its exquisiteness is even more evident when one observes it in person. 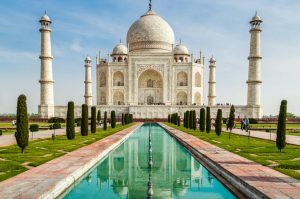 Taj Mahal, located in the city of Agra in India is widely referred to as the ‘Eternal Symbol of Love’. It was built by a Mughal Emperor, Shahjan as a memorial for his beautiful wife Arjumand Bano Begum who he christened as Mumtaz Mahal. The Taj Mahal is indeed a thing of beauty and was built by over 20,000 people from India and Central Asia. It was built using exquisite white marble and pietra dura (marble inlay work) and was decorated with thousands of precious stones. Verses from the Quran have been engraved throughout the structure. The carvings on the entire structure are intricately and meticulously made and add to the beauty of the monument. The monument took about 22 years for completion and more than 20,000 humans and 1000 elephants were employed. Legend has it, the hands of all those who built the Taj Mahal were cut off by Shahjan. The Taj Mahal remains immaculate and is a symbol of India’s rich cultural heritage to this date. These structures are indeed a standing testimony of what man can do with just a piece of land and hard rock.